Bangkok is the now capital of Buddhist Thailand; and over the years of its existence its royals have developed some amazing pieces of architecture. These places can get very busy in the daytimes, so our hot tip is to get there first thing in the morning, or just before it closes to avoid the madding crowds. The Golden Mount is part of the Wat Saket temple located just outside the old royal city precincts next to the Pom Mahakhan fort. The mount has a somewhat unusual history. It was started by King Rama III early in the 19th century, who wanted to build a large chedi on the site to mark the entrance to the city. 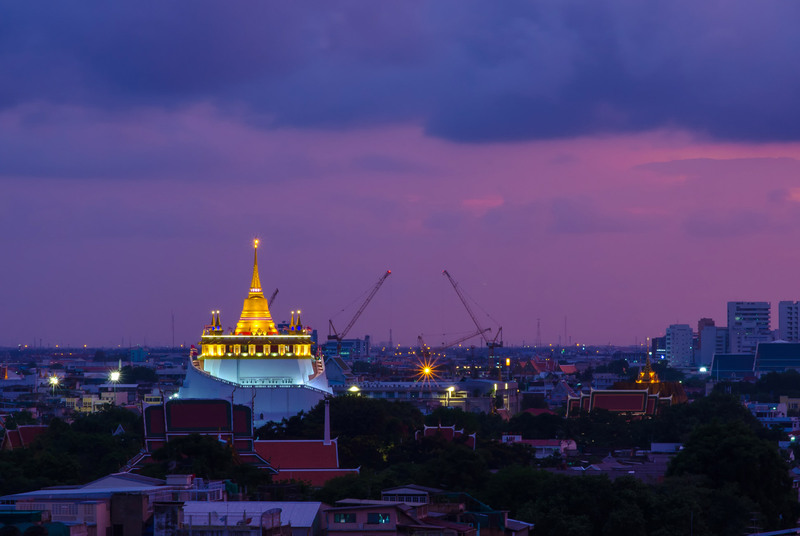 Wat Arun, the Temple of Dawn, is one of Bangkok’s best know landmarks. It stands on the west bank of the Chao Phraya River in Thon Buri. Wat Arun is best seen from the opposite bank of the river as it glistens in the sunlight during the day and stands dark and noble at dawn or dusk. A visit to the beautiful, peaceful monastery complex surrounding the familiar towers is very worth-while. These towers, the “Phra Prang,” although best known, are only part of Wat Arun. It also contains narrow lanes; elegant, historic white buildings; shrines and a pools of turtles. Temple of the reclining Buddha. At 20 acres large, it is the largest temple in Bangkok, and is technically the oldest too, as it was built around 200 years before Bangkok became Thailand’s capital. Not actually a temple, but scared nevertheless. The palace has been the official residence of the Kings of Siam (and later Thailand) since 1782. Today it is one of the main tourist attractions of Bangkok. Here you will also be able to visit the sacred Emerald Buddha Temple and the numerous official buildings, halls, pavilions set around open lawns, gardens and courtyards.